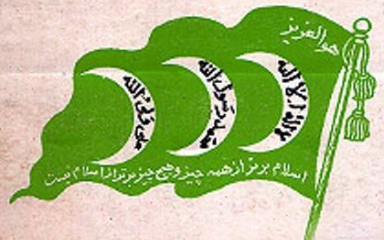 Fadā'iyān-e Islam was an Iranian Islamic fundamentalist terrorist secret society founded in 1946 by a 21 year-old theology student Navvab Safavi, who sought to purify Islam in Iran by ridding it of 'corrupting individuals' by means of carefully planned assassinations of certain leading intellectual and political figures. The group survived as supporters of the Ayatollah Khomeini and the Islamic Revolution of Iran. During the 1979 Iranian Revolution, Fadayan members served as foot soldiers for Khomeini and formed part of the fundamentalist wing of the revolutionary base, pressuring Khomeini to implement rule of Islam immediately. They called for a "wholesale introduction of Islamic legal and social codes including a ban on music, alcohol, the cinema, usury, women working outside the home and compulsory veiling." Many of its members went on to serve in the Islamic Republic regime. Fedayeen-e-Islam, also known as Islamic Warriors, Fedaye Islam, Fadayan-e-Islam, Devotees of Islam is an active group formed c. 1946.